I would like to add the following 2 (there are many more such examples, all over India). These may not be technically modern day civil engineering, but nevertheless marvelous constructions indeed. Greatest Construction Project compleated in the world. 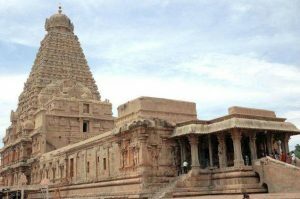 The entire temple structure is made out of granite, the nearest sources of which are about 60 km to the west of Thanjavur. Again, these are nearest possible sources – no one is sure where they got so much granite from. The temple tower) is 216 ft (66 m) high and is among the tallest of its kind in the world. The the apex or the bulbous structure on the top of the temple is carved out of a single rock and it weighs around 80 tons. I am not able to quote the source, but I read somewhere that they built an inclined platform from the top of the temple to another village about 6-7Kms away from the temple and using elephants they pulled / pushed this huge 80-tonne granite to the top of the temple. I had the privilege of visiting this temple long back and had the opportunity to view the inner part of the temple tower. It was a spiral, spring like structure inside to hold the enormous weight on top of it. It’s just an amazing piece of architecture. This can be the hardest and toughest construction project compleated in India. The United Arab Emirates knows that the oil isn’t going to last forever. Its prime minister, Sheikh Mohammed, is also the Emir of Dubai, and he has spent the last two decades working to turn his city into a world-class tourist mecca that can survive without petrodollars. But many of his challenges have been geographic: there’s only so many miles of beach on the Persian Gulf. 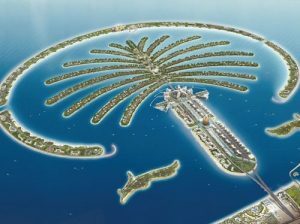 It’s not easy to add hundreds of miles of coastline to a crowded city, but that’s exactly what Dubai is trying to do—by building the world’s three largest artificial islands.The first and smallest being Palm Jumeirah.This island takes the form of a palm tree, topped by a crescent.The creation began in June 2001. Six-lane undersea tunnel connects the island to the beaches on the crescent, while the Middle East’s first monorail runs the length of the island. 1. The planning of the Palm Island Dubai consisted of over one hundred studies just to determine the feasibility of the project. 2. The Island is actually of series of islands connected together made to look like a palm tree. There is nothing else in the world like it. 3. The Island is one of the few objects that are visible from space to the naked eye. Another landmark that is visible is the Berlin Wall, The Great Wall of China. 4. The crescent that surrounds the Palm Island acts as a breakwater to protect the island from high waves in case of a typhoon or storms. The breakwater consists of sand, geotextile fiber as well as small and medium rocks which help to make it strong and stable. 5. The island technically is not an island at all as it is connected to the mainland by a bridge. 6. 94 million cubic meters of sand and 7 million tones of rock have been used in the build. 7. More than 800 football pitches could sit on the Palm Jumeirah. 8. The amount of material used could create a 2 metre high and half a metre wide wall that would circle the world three times. 9. A six lane sub-sea tunnel has been built to connect the spine to the crescent. The tunnel is 1.4 km long, 40m wide and 25m below sea level. 10. Every single one of the first phase properties – 4000 in total was sold within 72 hours of the initial sales release.